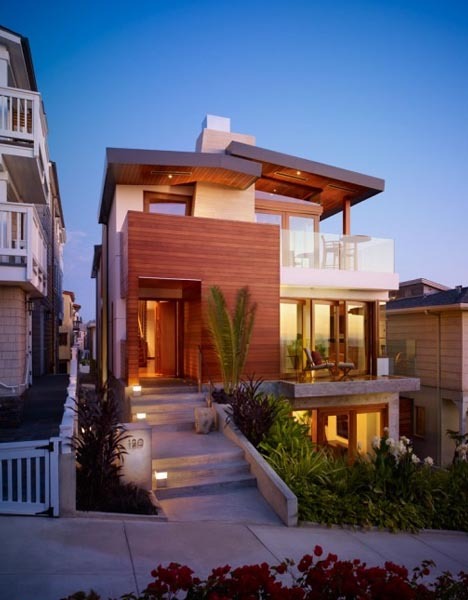 By Alejandro LazoJanuary 20, 2012, 10:49 a.m.
Home sales rose nationally in December, marking the third consecutive month that the market has shown improvement. Previously owned homes were sold at a seasonally adjusted annual rate of 4.61 million units, up 5.0% from November and 3.6% from December a year prior, according to the National Assn. of Realtors. About one in three homes sold last month was a so-called distressed sale, either a foreclosure or a short sale, the latter involving a bank allowing a home to be sold for less than the outstanding debt on the property. Roughly one in three homes was purchased in cash. The nation’s housing inventory dropped 9.2% from the prior month, to 2.38 million homes available for sale. That represents a supply of six months and a little less than a week. Economists consider about six months of supply to be a stable market. I have been waiting for more than five years to offer this advice. It is now time in most cities across the country to buy a new home or refinance your existing home with thirty-year fixed rate mortgage debt. And this from the author of The Coming Crash in the Housing Market published in 2003 and my 2006 book, Sell Now! The End of the Housing Bubble. Let me explain why. Home prices are off anywhere from 10% to more than 60% in cities across the country. There is no reason to believe that prices were “fair” during the bubble as we have seen they were largely caused by loose and aggressive lending by banks and non-banks. But, it is always better to buy at a discount rather than at a historical peak, and these seem like awfully big discounts. And by my calculations, in most cities across the country, real prices adjusted for inflation have just about come into line with where prices were in 1997, before all this crazy bank lending started, so there should be little additional downside risk by buying today. There are still some neighborhoods across the country that have not seen very dramatic declines in price, many of them very wealthy and expensive enclaves, but given the distribution of incomes lately heavily weighed toward the wealthy, these areas may never see a really large home price decline. Homes in many cities across the country are now selling for as little as $60 to $70 a square foot. Depending on the quality of construction and the underlying land value, this represents a 50% to 65% discount to the costs you would incur if you tried to build a similar home today in these cities. While there is no guarantee that there will be a strong rental market in the short run, in the long run it just seems to make sense to buy if you can acquire assets at half or less of the cost of building them. During the peak years of the housing bubble, entire cities like San Diego were seeing their homes priced on average at 11 times the area’s median family income. Such prices financed primarily with debt are by definition unsustainable. Now, because banks have pulled back on their lending formulas, homes in many cities are changing hands at three to four times average family incomes. Similarly, at the peak, houses traded at such large multiples of possible rents that it made the projects uneconomic from the start. Now, with homes trading at more reasonable multiples of rents, houses and condos can be purchased that are immediately cash flow positive in year one and enjoy all the upside of any appreciation that will occur as inflation returns. We still talk about home prices in dollar terms, which is silly because the dollar has lost 98% of its purchasing power relative to a more stable asset like gold over the last fifty years. If instead of pricing houses in dollars, we look and see what a home would cost in ounces of gold, we see that houses today are a real bargain. 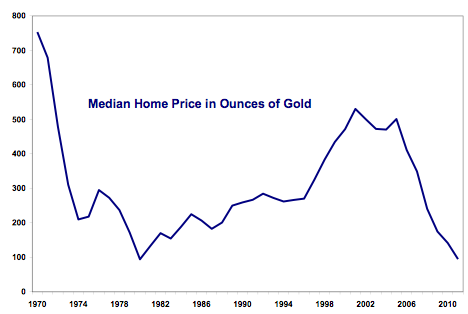 As a matter of fact, this graph shows that average homes, measured in the number of gold ounces it would take to buy them are now trading at forty year historical lows. You might argue that this is because gold is priced highly today. I would argue that gold’s purchasing power has changed very little over time, it is the dollar that is depreciating and thus giving the appearance that the price of gold is rising. Actually, gold is quite stable relative to other assets and commodities and it is the dollar that is highly volatile and declining in value due to the US funding its deficits by printing dollars. The real bubble out there is longer US Treasuries and 30-year fixed rate mortgages for homebuyers. With US debt equal to its GDP and equal to more than four times our government’s total tax revenues and with annual deficits of $1.3 trillion and growing, it is amazing to me that people will lend to the US for thirty years for less than 3.0% a year. Even more amazing is that individual homeowners can borrow at 4.0% (around 3% after tax) for thirty years on a fixed rate basis, some 300 basis points better than Italy which has a lot more people and makes much better shoes. Homes may not appreciate greatly in real terms over the next twenty years, but they don’t have to if inflation comes back, which is the only way the US and Europe are going to get out from under the huge debts on their countries and their banks. You may not make a lot in real terms on the house, but if inflation returns, you could make a killing on your investment as your thirty year debt becomes worth less and less in real terms. Run the numbers, but if inflation and interest rates go back to say, 7% to 8%, you could easily make eight to ten times your equity investment on the house because you locked in your borrowing costs and home appreciations historically have always correlated well with unanticipated inflation. So, run, do not walk to your neighborhood banker and either finance a new home purchase or take out the maximum amount of money he or she will lend you on a home equity loan and buy hard assets, not financial securities, with the money. When inflation comes roaring back the only perfect hedge is to be a borrower, not a lender or investor. Shakespeare said “Neither a borrower nor a lender be,” but they didn’t have huge government deficits and the risk of future inflation back in the Bard’s time. John R. Talbott, previously a Goldman Sachs investment banker, is a best selling author and economic consultant to families. You can read more about his books, the accuracy of his predictions and his family consulting activities at www.stopthelying.com. The reeling housing market has come to this: To shore it up, two Senators are preparing to introduce a bipartisan bill Thursday that would give residence visas to foreigners who spend at least $500,000 to buy houses in the U.S. The provision is part of a larger package of immigration measures, co-authored by Sens. Charles Schumer (D., N.Y.) and Mike Lee (R., Utah), designed to spur more foreign investment in the U.S.
Foreigners have accounted for a growing share of home purchases in South Florida, Southern California, Arizona and other hard-hit markets. Chinese and Canadian buyers, among others, are taking advantage not only of big declines in U.S. home prices and reduced competition from Americans but also of favorable foreign exchange rates. To fuel this demand, the proposed measure would offer visas to any foreigner making a cash investment of at least $500,000 on residential real-estate—a single-family house, condo or townhouse. Applicants can spend the entire amount on one house or spend as little as $250,000 on a residence and invest the rest in other residential real estate, which can be rented out. The measure would complement existing visa programs that allow foreigners to enter the U.S. if they invest in new businesses that create jobs. Backers believe the initiative would help soak up an excess supply of inventory when many would-be American home buyers are holding back because they’re concerned about their jobs or because they would have to take a big loss to sell their current house. “This is a way to create more demand without costing the federal government a nickel,” Sen. Schumer said in an interview. International buyers accounted for around $82 billion in U.S. residential real-estate sales for the year ending in March, up from $66 billion during the previous year period, according to data from the National Association of Realtors. Foreign buyers accounted for at least 5.5% of all home sales in Miami and 4.3% of Phoenix home sales during the month of July, according to MDA DataQuick. Foreigners immigrating to the U.S. with the new visa wouldn’t be able to work here unless they obtained a regular work visa through the normal process. They’d be allowed to bring a spouse and any children under the age of 18 but they wouldn’t be able to stay in the country legally on the new visa once they sold their properties. The provision would create visas that are separate from current programs so as to not displace anyone waiting for other visas. 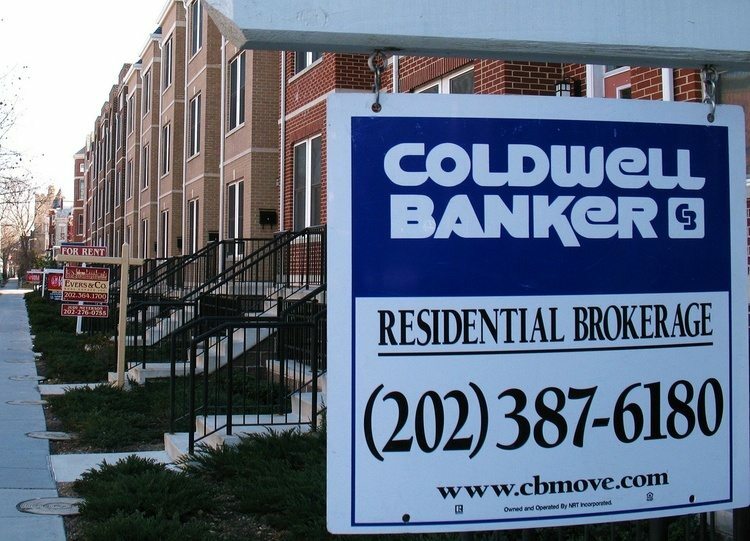 There would be no cap on the home-buyer visa program. Over the past year, Canadians accounted for one quarter of foreign home buyers, and buyers from China, Mexico, Great Britain, and India accounted for another quarter, according to the National Association of Realtors. For buyers from some countries, restrictive immigration rules are “a deterrent to purchase here, for sure,” says Sally Daley, a real-estate agent in Vero Beach, Fla. She estimates that around one-third of her sales this year have gone to foreigners, an all-time high. In March, Harry Morrison, a Canadian from Lakefield, Ontario, bought a four-bedroom vacation home in a gated community in Vero Beach. “House prices were going down, and the exchange rate was quite favorable,” said Mr. Morrison, who first bought a home there from Ms. Daley four years ago. The idea has some high-profile supporters, including Warren Buffett, who this summer floated the idea of encouraging more “rich immigrants” to buy homes. “If you wanted to change your immigration policy so that you let 500,000 families in but they have to have a significant net worth and everything, you’d solve things very quickly,” Mr. Buffett said in an August interview with PBS’s Charlie Rose. The measure could also help turn around buyer psychology, said mortgage-bond pioneer Lewis Ranieri. He said the program represented “triage” for a housing market that needs more fixes, even modest ones. The measure may have a more targeted effect in exclusive markets like San Marino, Calif., that have become popular with foreigners. Easier immigration rules could be “tremendous” because of the difficulty many Chinese buyers have in obtaining visas, says Maggie Navarro, a local real-estate agent. Bargain hunters snap up foreclosures, and the median home price continues to fall. California home sales picked up in September from the same month last year as prices came down. 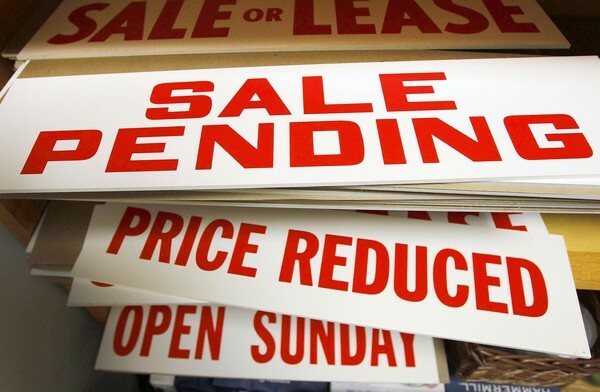 Sales were up 6.7% as bargain hunters paying cash snapped up foreclosures. Sales figures remained below the average for September in Southern California and the Bay Area, according to DataQuick, a real estate information service based in San Diego. As is typical, sales were lower than in August, down 6.2%, for a total of 35,404 homes sold last month.